The purpose of this study was to determine the effect of temperature on glucose levels produced during the process of hydrolysis of pineapple leaves using 0.5M of sulfuric acid catalyst. The temperature used in the hydrolysis process is 30 °C and 120 °C while the time variation used for the determination of glucose is 0.15,45,75,105,135 minutes. The method of glucose analysis used is to use is phenol-sulfuric acid to determine total glucose. The results showed that the highest glucose level was achieved at 120 °C with a concentration of 15.214,49 ppm at 105 minutes. While the lowest glucose levels achieved at a temperature of 30 °C with levels of 399.33 ppm at 0 minutes. Mosier, N., Wyman, C., Dale, B., Elander, R., Lee, Y. Y., Holtzapple, M., & Ladisch, M. (2005). Features of promising technologies for pretreatment of lignocellulosic biomass. Bioresource Technology, 96(6), 673–686. Risnoyatiningsih, S. (2011). Hidrolisis Pati Ubi Jalar Kuning Menjadi Glukosa Secara Enzimatis. 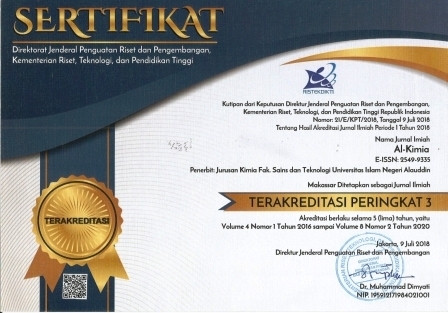 Jurnal Teknik Kimia, 5(April), 417–424. Tomás-Pejó, E., Oliva, J. M., & Ballesteros, M. (2008). Realistic Approach For Full-Scale Bioethanol Production From Lignocellulose: A Review. Journal of Scientific and Industrial Research, 67(11), 874–884. Wahyudi, J., Wibowo, W. A., Rais, Y. A., & Kusumawardani, A. (2011). Pengaruh Suhu Terhadap Kadar Glukosa Terbentuk dan Konstanta Kecepatan Reaksi pada Hidrolisa Kulit Pisang. In Prosiding Seminar Nasional Teknik Kimia “Kejuangan” (pp. B09-1–5). Yogyakarta. Wiyantoko, B., Rusitasari, R., Putri, R. N., & Muhaimin. (2017). Identifikasi Glukosa Hasil Hidrolisis Serat Daun Nanas Menggunakan Metode Fenol-Asam Sulfat Secara Spektrofotomeri UV-Visibel. In Prosiding Seminar Nasional Kimia FMIPA UNESA. Surabaya: Fakultas MIPA Unesa.